Like its predecessor, the 4810 Orbis Terrarum is certainly value for money and this version sees little changes being made which is no surprise to us given the excellent reception & reviews received for its original model. This watch would be a cool addition given its design, the aesthetics of it and more so for the price which is reasonable for what you are getting. This year we see the release of a newly-revamped model of the Montblanc Orbis Terrarum, the 4810 Orbis Terrarum at Baselworld 2016. 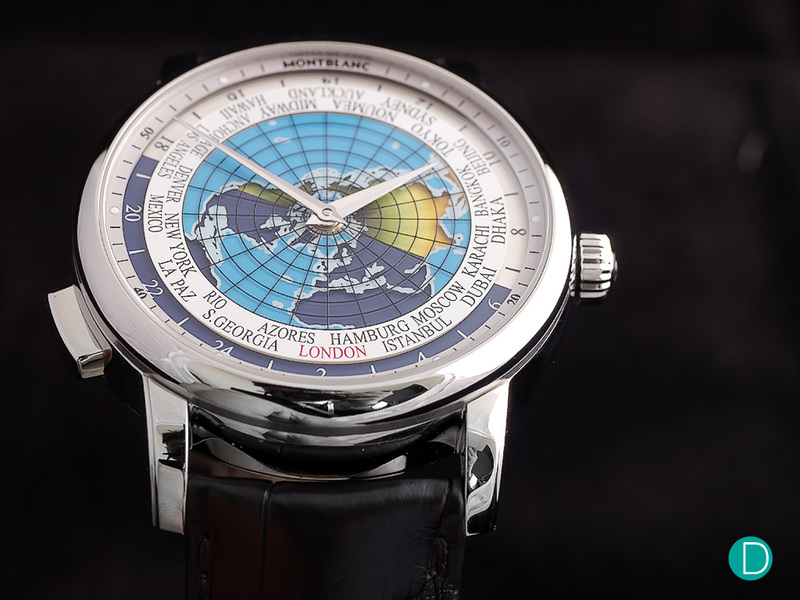 It’s predecessor, the Montblanc Heritage Spirit Orbis Terrarum was a huge hit at the SIHH show in 2015, offering great value in terms of attractive pricing and outstanding quality. For just US$ 6,300, a collector can own a world-timer complication which is certainly worth it if you consider other world-timers such as the Vacheron Constantin Patrimony Traditionnelle World Time going for many times that price. The introduction of the new 4810 collection was to commemorate both Montblanc’s 110th anniversary as well as the 10th anniversary of the 4810 line that was released back in 2006 to celebrate Montblanc’s centennial anniversary. In this new interpretation of the Montblanc Orbis Terrarum, we see many new refinements being made to the watch and notably, a distinctive difference in the main sapphire crystal disc. Let us take a closer look at this fabulous timepiece. 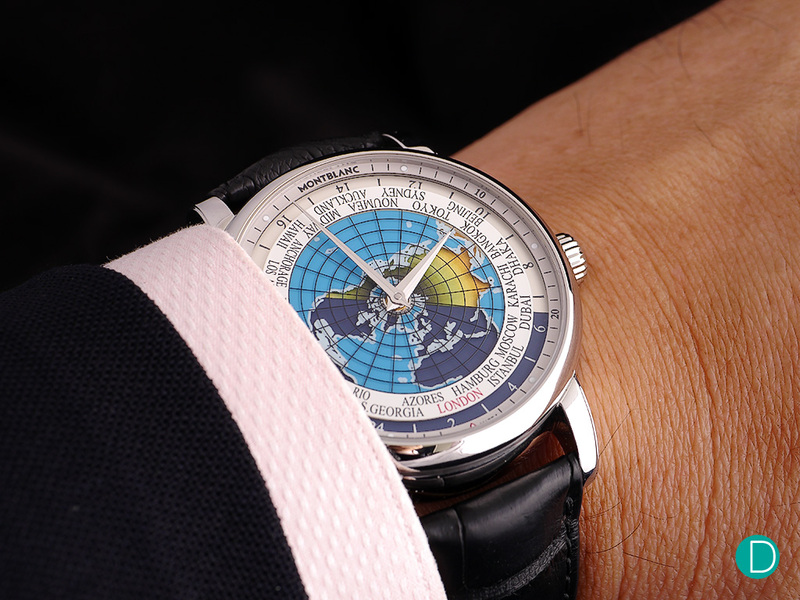 The 4810 Orbis Terrarum comes in a stainless steel case with a diameter of 43 mm. The case comes with a polished bezel and nicely finished lugs. 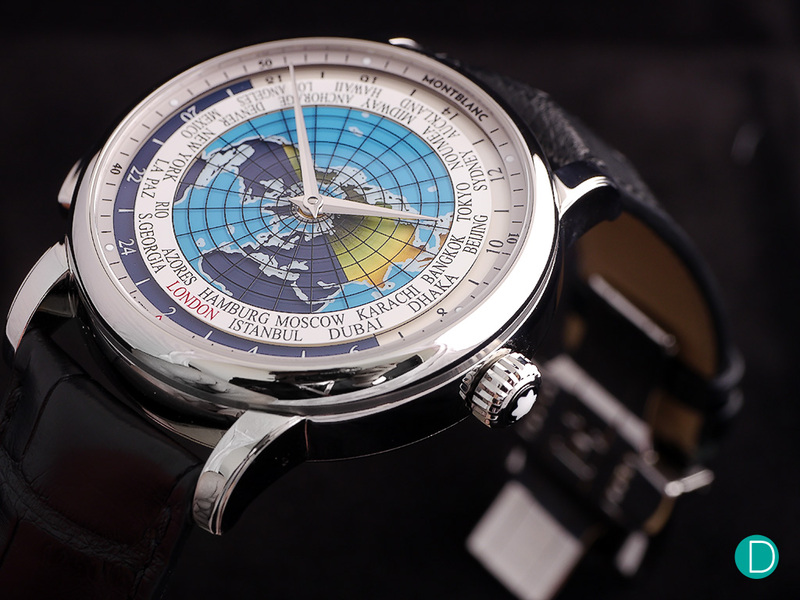 The casing is slightly bigger when compared to its predecessor, the Heritage Spirit Orbis Terrarum – 41 mm. With a bigger casing, many would have concerns on having a comfortable fit on the wrists and these concerns are quickly put to rest with the inclusion of short, rounded lugs to ensure a better fit. 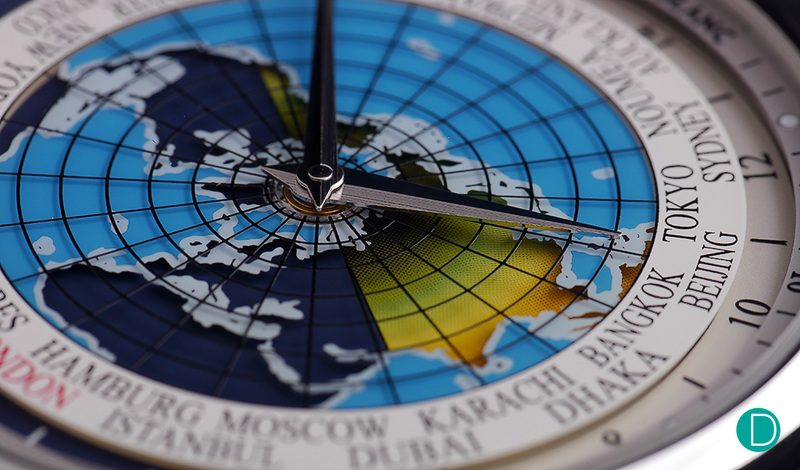 What is so captivating about this timepiece is the construction of the dial, made of several layers with the main sapphire crystal disc displaying the continents as viewed from the North Pole and the names of 24 cities representing different time zones. The continents are cut out from the rest of the disc that displays the oceans in a light blue colour. One of the more notable difference of the 4810 Orbis Terrarum when compared to its predecessor is the more colourful design of its dial to distinguish between night and day. In this iteration of the Orbis, the second sapphire crystal disc indicates the passing of day and night with a dark blue for the night and the use of a gradient of yellow and green for the day. This disc also includes the 24-hour ring that help indicate the different times in the 24 cities displayed. Amidst all the complexity on the dial, the rhodium-plated, regate-shaped hands complements well with the more colourful and aesthetically-pleasing dial. More importantly, it provides maximum legibility to the user due to its distinct shiny appearance. Also, one of the more subtle refinement we see in this version would be the minutes circle where the new design includes an indicator for each 5-minute mark. Similar to the Heritage Spirit Orbis Terrarum, the adjustment of time is fairly simple. To adjust, the local time of the city you are in has to be positioned right in front of the red triangle (located at the 6 o’clock position). The hours and minutes (which are linked with the day/night and 24-hour timezone disc) can be easily adjusted using the crown to set local time. Once finished, the time in all 24 timezones will be simultaneously displayed around the dial. When travelling to another timezone, the new destination city simply needs to be aligned at the 6 o’clock position. This adjustment can be made via the use of the pusher located at the 8 o’clock position, which automatically turns the hour hand, continents, cities, day/night disc and 24-hour timezones along with it. By clicking on the pusher, the hour hand would also start shifting by jumping in one hour increments without affecting the precision of the minutes. Once this easy regulation is completed, the local time of the new destination, as well as the 24 timezones, are fully synchronized. The 4810 Orbis Terrarum is powered by the Calibre MB 29.20, similar movement used in the Heritage Spirit Orbis Terrarum. 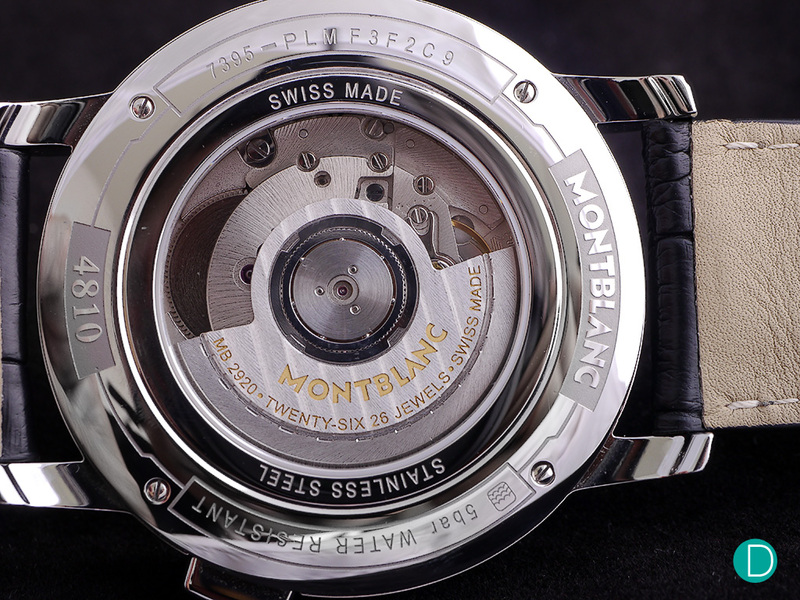 The movement operates at a frequency of 28,800 A/h (4 Hz) and has a power reserve of approximately 42 hours. This movement features an in-house world time module that is made in-house by Montblanc while the base of the movement is a Sellita. The quality of the movement is considered reasonably good considering the price of this timepiece and one of the differences it has from other world-timers is that the world-time module is integrated with the movement and not fitted on the top as other world-timer complications would do. The 4810 Orbis Terrarum offers many new, subtle refinements when compared to its original version, the Heritage Spirit Orbis Terrarum. We do not see a big difference between the two except for notable changes in the design of the sapphire disc, the size of the casing and also, a revised list of cities on the dial. This larger version of the Orbis Terrarum at 43 mm would still prove to be a hit with fans of Montblanc watches given its functionality and a more aesthetically-pleasing design with more colours on it. 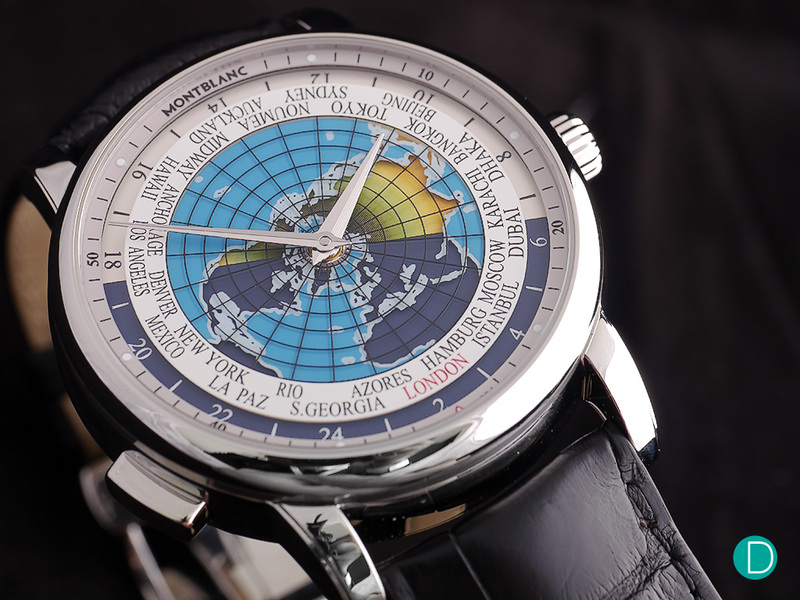 Retailing at S$ 9200, this watch is definitely value-for-money considering it’s a world-timer and it is not surprising given Montblanc’s drive to deliver excellent value to its customers at great prices.